The tradition of family ownership and management continues to this day, with the fourth generation Chris Adam, Managing Director.The continuity of traditional family values coupled with modern machinery and high quality raw materials provides customers with high quality and good value carpet – a standard which Adam Carpets are determined to maintain. is the original ‘hard twist’ carpet. We put up to 30% more ‘twist’ into the yarn to make sure the carpet is durable and stays looking better for longer. There are an amazing 60 colours to choose from, some reflecting today’s fashions and trends, whilst others are more classical in their tone. Made with the finest British Wool, this superior carpet has a 42oz pile weight and is available in 4m and 5m widths. 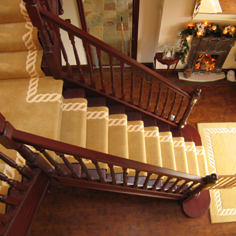 is almost unique in that it is made with a luxurious velvet finish and has a mirror alignment to make it look more aesthetically pleasing on stairs. This carpet is made with the finest 2-ply yarns, which help resist ‘pile reversal’. It is available in 4m wide, to give flexibility around the home and not just on stairs. The 11 colours are bold and stunning, giving you the option to be more creative and make as statement. is an iconic name within the carpet industry. Its name is synonymous with colour, quality and style. It is made on a twin needle bar which is almost unique within the industry. This gives Fine Worcester its almost ‘billiard table’ finish. The 2-ply yarns are tufted on a 1/10th gauge machine, which also separates this beautiful carpet from the rest of the crowd. 65 colours are available in 4m and 5m widths, giving everyone the opportunity to find the right colour for them. is a magnificent blend of velvet and twist textures that produces a truly stunning finished carpet. Available in 7 colours and in 4m wide, we use only the finest 2-ply yarns to ensure durability and appearance retention. offers consumers a real thick berber carpet at a outstanding price. Considering the yarn and raw material that we use, this product represents amazing value for money. Available in 12 berber shades, in 4m and 5m widths, we believe it offers something for all consumers looking for a textured twist carpet. represents outstanding value for money. It gives all consumers the opportunity to put a quality Adam Carpet into their homes. This 38oz carpet still uses the finest raw materials available and is made with British wool. It offers a blend of strong colours and berber yarns, allowing consumers real choice at this price point in the market. It is also available in 4m and 5m widths. is arguably the most beautiful carpet on the market today. It is made using ‘superfine’ 2-ply yarn on a twin needle bar tufting machine. This gives an unrivalled ‘smooth’ finish. It has a robust 44oz pile weight and is available in 18 timeless colours. It comes with 4m and 5m widths on offer. is unique in offering a tonal carpet produced in wool. We blend three colours together during the tufting process, to give a unique finish for consumers looking for a blend of plain and pattern carpets. 16 colours are available in 4m and 5m wide. We use British wool in its production and this ensures that the appearance looks better for longer. was our first overtuft carpet just over ten years ago. It has continued to be developed and we now offer 13 colours in 3 different designs. It is our most popular overtuft range, as it offers ‘woven quality, tufted price’. Made with the finest 2-ply British wool, Inspirations® is suitable for commercial projects, as well as domestic installations, the wear quality of this carpet is highly praised. 4m and 5m widths are available. Launched in 2011, Boulevard has become an instant classic. It is an overtuft product offering ‘woven quality at a tufted price’. The beauty of this carpet is its heavy 40oz pile weight. You really have to feel the quality of this carpet to believe it. It is available in 14 colours and in 4m and 5m widths. It was shortlisted for ‘Best Carpet’ at the 2011 House Beautiful Awards. Introducing Marquette Plaid – a stunning take on the traditional Plaid design. We have given the design a fresh and unique new look by turning the pattern design 45 degrees on the diagonal. Available in 17 stunning designs and colours and available in 4m and 5m wide, this 40oz carpet is ready to make a statement, are you?